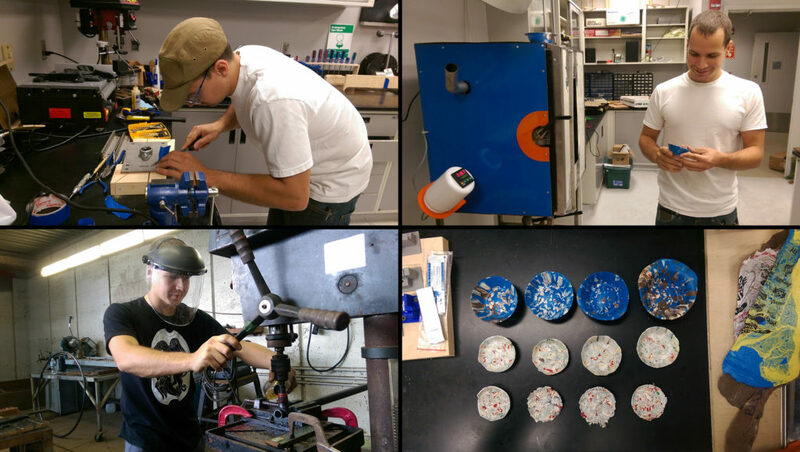 During the month of July, the REBOOT Laboratory at the Facility for Arts Research (FAR) has hosted visiting artist, designer, and craftsman Matt Jeffs. During this time, Jeffs has been working with REBOOT Director Rob Duarte to design and create objects, tools, and material samples that will be exhibited at the ACC Smithsonian Creativity and Innovation Festival in October 2017. Both Jeffs and Duarte will attend the exhibition at the Smithsonian Museum of American History as representatives of the creative research being done at FSU. REBOOT Laboratory is a studio setting in which artists and designers work collaboratively with the lab’s director Rob Duarte to create works that utilize the waste materials produced by capitalism and conspicuous consumption. To learn more about Matt Jeffs, please visit his website. More about REBOOT Laboratory can also be found at their website.